This is the origin story of Father Time and the world in which he lived - 21st century Earth. Seventeen year old homeless orphan Rolland Wright is plucked from his otherwise obscure, if not unlucky life when a bookstore fire forces him to assume the role of hero in a life or death situation, resulting in the startling discovery of his own time travel powers, a secret paradise known as Eden, an elite group of warriors (the Knights of Time) sworn to protect the time stream from evil, and the truth behind a family secret that sends him nearly two hundred years into the past to prevent a murder. 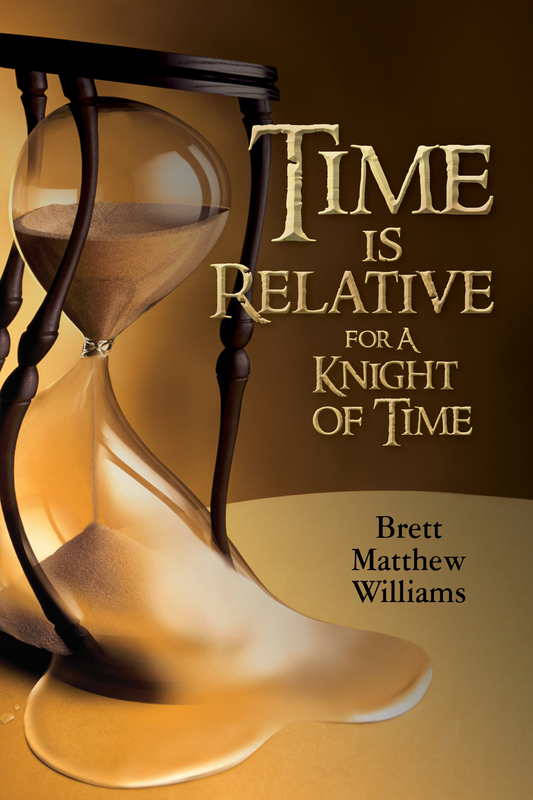 Rolland Wright takes his first steps to becoming the legendary figure Father Time in the first installment of the Tale of Time series; Time is Relative for a Knight of Time. There exists within our world a secret land that rests somewhere just outside of time and space. This place, this paradise, lush in it green valleys and fields where beast roam freely has gone by many names over the course of mankind including El Dorado, Avalon, Shangri-La, Agartha, Ys, Shambhala, Hyperborea, and Atlantis; but those who dwell there call their home Eden. The entrances to this paradise are located all over planet Earth, kept hidden by a clandestine group of time travelers who know how dangerous their supernatural abilities are, and go to great lengths to segregate themselves from the main population in order to keep them safe. Their identities are hidden, but the entrances to Eden are not. No, they are all around us, hiding in plain sight in the backrooms, basements, and storage areas of public libraries all over the world. Why else would public libraries still exist in the 21st century? The main inhabitants of Eden are traditionally human in appearance, despite possessing two extra chromosomes. This distinction, while important, is not vital to living a full life in the land known as 'paradise'. For Eden is a large place, best thought of as similar to an entire planet. The capitol of Eden, where all political, economic, and most businesses are based out of is Eden Town Proper, or simply Eden. This ancient bit of confusion has perplexed Eden linguists for generations as to why no one has proposed a solution for distinguishing between the two in a shorthanded way. It is estimated (as of the 2015 Eden census) that approximately one eighth of Eden, or twelve percent of the entire civilian population, do not bear the two extra chromosomes that allow for the supernatural abilities displayed by their counterparts. This anomaly often confuses newcomers to Eden, who assume that all Edenites are 'super powered' in some way. Rest assured that Eden does not discriminate, and that extra chromosomes or not, native born or not, Eden welcomes everyone with open arms. Perhaps the most distinguishing characteristic of Eden is the ever-flowing, constantly moving tide of translucent matter collectively known as the 'time stream' by Eden historians. This river, which stretches across the planet has been explored by numerous adventurers over the millennia, yet never has a beginning, nor an end to it been found. It is thought to run the entire duration of the planet, and all who have dared to venture too close to it have been lost forever into the sea of time. With the invention of the 'Dream Phoenix' by Dr. Judah Jacob Raines, PhD the inhabitants are able to travel throughout the time stream using extracted plasma from past time travelers, such as Scott Wright. Designed to be sentient by its maker, the Dream Phoenix often acts temperamental, refusing to identify the individual(s) with two extra chromosomes in any given time/place. This design flaw is currently under review, and updates are imminent. The Elemenos (pronounced phonetically just like the English alphabet l-m-n-o) are a race of green furred cat-like humanoids who have been subjugated to the status of second class citizens. Due to the passing of The Sapien Act in the early 20th century, the Elemeno population that chooses to live within Eden city limits are left with little in the way of housing, employment, or fair representation. A growing unrest at this inequality has begun stirring in the past few years fueled mostly by the Elemeno extremist groups. The Nocturns live mostly in the secluded city of Elysia, which rests roughly one hundred and fifty miles away from Eden Town Proper. Although equal as far as civil liberties and representation to humans, the Nocturns choose a secluded lifestyle, and have only recently decided to begin assimilating to the human way of living. An exchange program is under way, and the events are documented in Time is Relative for Wavering Loyalties. The Nocturns, a peaceful and literate people by nature, are slightly shorter than humans by average, have pointed ears, are extremely light on their feet, and quite often also carry the two extra chromosomes that seem to be native to peoples born in Eden. Likewise the Mer people, who call the vast Majestic Ocean their home and dwell deep within her caverns, are also beginning an assimilation process with the humans of Eden. Their transition however, has been more difficult due to the inner politics of the Mer Royal Court surrounding the throne. Very similar to what humans have dubbed 'mermaids' the Mer people possess gills located behind their human ears, and a large portion of their population actually have the ability to switch between breathing methods when on dry land. The newly appointed Duke Kniff of Clan Youngblood, the Queen's brother by birthright, has been selected as the first Mer cadet to attend the Academy of Light. His success will largely decide the future of the already uneasy alliance between Edenite humans, and Edenite Mers. As far as botanical elements are concerned, the plant life in Eden is both native and invasive, and includes many species now extinct on Earth. This strange combination has resulted in the cross-breeding of multiple plant species, creating rare fruits and vegetables that often explode in popularity so much that they spill over into the "real world" of present day Earth all the time. Chief among these are cherry tomatoes, grapples, and limequats. The most dangerous of all plant life in Eden are the shape shifting botanicals called sprockets, which possess pheromones that are attracted to vulnerability. Sensing their victims in such a way, sprockets will often times use perceived vulnerabilities against their prey, drawing them into a secluded area where their attack will not be hindered by other predators, or outside forces. To learn more about Eden, including the nearest entrance and visitor center hours check out both Time is Relative for A Knight of Time (available now via Amazon.com) & Time is Relative for Wavering Loyalties (Autumn 2015). The dark ﬁgure walked towards them, seemingly impervious to the chaos that surrounded the nation’s capital, the shadows and light from the inferno behind them dancing across him. As he neared, they saw that he was an older man with bits of silver streaking through the black mass of hair sitting atop his slim and polished frame. He was dressed in a dark crimson sweater vest over a pressed long-sleeved button down shirt, and what looked to be crisp and freshly tailored pantaloons. Brett Matthew grew up with a passion for both film and history. He began his career fresh out of high school as a Production Assistant/ football player on NBC Universal’s television series Friday Night Lights (of which he can often be seen in the first two seasons as a member of the championship team – Go Panthers!). He quickly moved on to serve as an Original Series intern with the USA Network in Studio City, California. Following work on shows like Monk, Psych, and Burn Notice, Brett returned home to Texas to continue his education, graduating with his degree in History from Texas State University. A proud Master Freemason, Brett thoroughly enjoys fantasy fiction, watching Netflix, running, baseball, Shakespeare, and spending time with his family and critters. Brett Matthew Williams will be awarding a $50 Amazon or Barnes and Noble GC to a randomly drawn winner via rafflecopter during the tour! Good morning and welcome to Wednesday. It's good to be here at Unabridged Andra! Thanks for the informative post - I'm looking forward to checking this book out~! Great excerpt, thanks for sharing. I like reading books that have something to do with time travel and this one is going to be good.